Right, that's your lot from the early Championship game. Ipswich got the early goal through Brett Pitman and ground out the type of victory you need to be close to the top of the table come the end of the season. But for MK Dons it's five without a victory and they stay 20th in the table ahead of the 15:00 GMT kick-offs. You can read Phil Cartwright's report of Ipswich's victory at MK Dons, while you can follow the rest of Saturday's football action in our live text commentary here. The Tractor Boys should be happy - they're into the Championship's top six with their 1-0 win. MK Dons manager Karl Robinson was clearly not happy with the referee at the end of the game, probably because of the lack of added time, as he waited around at the end of the game for the officials to head to the tunnel so he could have words with Gavin Ward. Ipswich midfielder Cole Skuse told Sky Sports: "It was a massive win for us. We dug in very deep, the back four were outstanding. Jonas Knudsen demonstrated that at the end. "We've gone under the radar a little bit, we had a great season last season and are keeping ourselves in the mix." A contested drop-ball was the last action of the match, and Karl Robinson is not happy at the final whistle as his side are without a win in five. 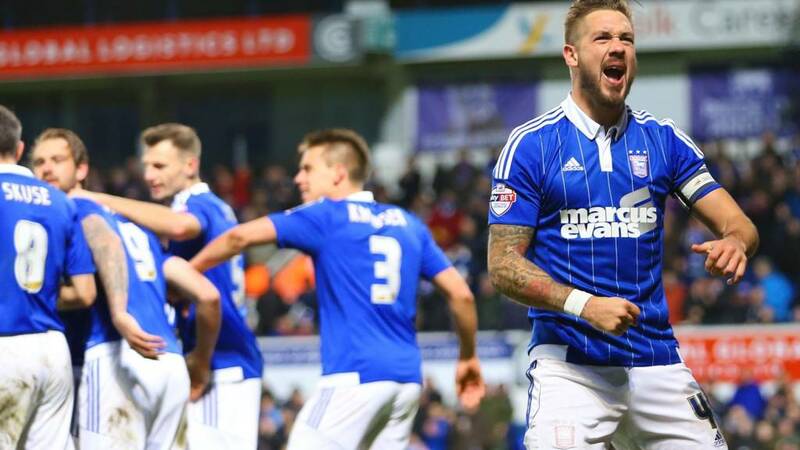 But Ipswich have held out for their fourth win in six games. Rob Hall absolutely smashes the ball right in the face of Jonas Knudsen after the MK Dons winger turned Jonathan Douglas inside out and the ref stops play, much to the frustration of the hosts. The ball is aimed in at Martin but he can't connect to it and Ipswich frantically clear, but the ball isn't dead yet as MK Dons keep coming. Dean Lewington tries to squeeze in Daniel Powell but an Ipswich toe gets it out for a corner and goalkeeper David Martin goes forward!!! We're into four minutes of added time here. Can MK Dons salvage anything or will Ipswich hold out for their fourth win in six? The chances are coming thick and fast now as MK winger Rob Hall cuts inside on his left and forces Dean Gerken into a smart save. Ipswich clear and win a throw in in the opposition half to slow the game down. David McGoldrick sets up Cole Skuse for an Ipswich chance, but the midfielder shows us why he has only scored once for Town with a poor effort. Nicky Maynard receives the ball on the edge of the area for MK Dons, but the ref adjudges him to have fouled Luke Chambers. That looked rather soft. As things stand Ipswich are heading into the top six, for a few hours at least. Birmingham are one of the teams that could move above them again this afternoon. They've just arrived for their game at Middlesbrough. Both sides made a change as Freddie Sears comes off for David McGoldrick, still returning from a long-term injury, for Ipswich. Meanwhile defender Jordan Spence is replaced by Rob Hall in an attacking move by Karl Robinson. MK Dons sub Ben Reeves provides us with a nice bit of trickery to lift a grounded pass over his shoulder and volley towards goal, but it's easy for Dean Gerken to hold. If only MK Dons had showed this urgency sooner. Daniel Powell has changed the game for MK Dons and he breaks into the area but under pressure from Luke Chambers and Jonathan Parr nudges the ball too far for Jonathan Douglas to clear. Josh Murphy then has a go from the edge of the box, but his strike is flicked over by namesake Daryl for another corner, which Tommy Smith needs to be at his best from to deny a goalscoring chance. This is much better from the hosts. Ben Reeves comes the closest MK Dons have come all game as his left-foot strike from the edge of the area forces Dean Gerken to tip past the post. Then Samir Carruthers forces Gerken to tip over his bar. Ipswich striker Daryl Murphy should have put this game to bed. The corner comes back out to taker Ainsley Maitland-Niles and his ball in finds Murphy with tons of space, but the forward puts his shot just wide of the goal when under no pressure. Afterwards, Ipswich make their first change, bringing off Maitland-Niles for Jonathan Parr. The build-up is starting for Saturday's nine 15:00 GMT kick-offs in the Championship. This chap is back on familiar territory today - Joey Barton starts for Burnley against his former club QPR at Loftus Road.